Sania Mirza has been a great role model for girls but tennis in India still needs to be popularized. Tennis revolution in Russia in the 1990s can serve as a good example. Although Mirza and Vesnina lost an exciting semi-final to the Russian duo of Svetlana Kuznetsova and Vera Zvonareva, they are still in the reckoning for the mixed doubles title with their respective Indian partners. Vesnina is teaming up with doubles legend Leander Paes and Mirza with Paes’ former partner Mahesh Bhupathi, who has a knack for winning mixed doubles at grand slams. Vesnina and Mirza played together at Wimbledon in 2011 and made it to the semi-final there as well. Vesnina’s Indian connection goes even further back. The 25-year old Russian broke into the professional ranks after playing well in International Tennis Federation tournaments in Chennai and Bangalore in 2003. Vesnina also teamed up with Bhupathi and the pair reached the mixed doubles finals at Wimbledon last year. 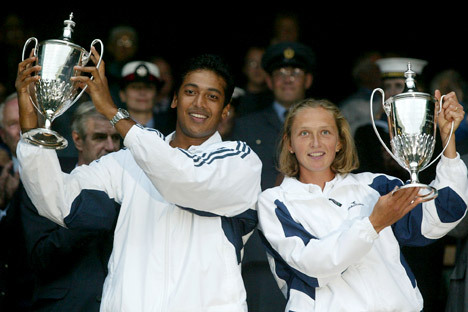 Bhupathi, who has won a total of 7 mixed-doubles grand slams, had a successful pairing with another Russian, Elena Likhovtseva. The duo won the 2002 Wimbledon title and fell short at the final obstacle a year later at the French Open. India is considered a hot favourite to win gold at the Olympics in the mixed doubles since the country has three of the world’s top men’s doubles players: Bhupathi, Leander Paes and Rohan Bopanna. Unfortunately only one of them can team up with Mirza. It’s too bad that the Olympics don’t offer shared or joint medals. If that was the case, we could have surely had 3 gold medals in doubles’ tennis for both India and Russia (and given how well Sharapova is playing, a fourth one for Russia). Jokes aside, India needs to study the Russian success story in women’s tennis. If there was one good thing that Boris Yeltsin did for Russia, it was the popularization of tennis. A similar women’s tennis revolution in India, would do a lot of good for sport in general in a country obsessed with cricket. Surely, it can’t be that hard to find children with great tennis potential in a country of 1.2 billion, can it? Sania Mirza has been a great role model for Indian girls, but something more needs to be done to develop the sport in India. May be our Russian friends have some ideas? Meanwhile, an exciting few days of tennis are coming up in Melbourne with some classic match-ups in the men’s singles, but let’s also keep an eye on the Indians and the Russians out there, who will hopefully keep the tricolours flying high on Sunday.